These guys know how to make bleed control kits. Meet the Individual Patrol Officer Kit (IPOK). This small bleed control kit is perfect for your active shooter training. If you need compact and sealed up to meet weather requirements this is the kit for you. 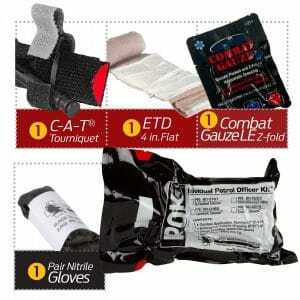 This kit is perfect to throw in your range bag, keep in your patrol vehicle or have it handy to stop the bleed. It’s a perfect tactical medical kit. It contains the latest Combat Application Tourniquet Gen 7 and NAR S-rolled gauze or even change it out for some combat gauze in a nice and tight vacuum sealed plastic. These are the contents of these bleed control kits. This bleed control kit is a great size coming in at a height of 4 in. x width of 6.5 in. x D 2.75 inches. This kit will easily fit in your cargo pocket or any pouch on your tactical gear setup. It weighs only 7.4 ounces, so no need to worry about adding additional weight to your tactical gear. They come with emergency trauma dressing and nitrile gloves as well. These kits are very affordable and a great choice of tactical gear to pair up with any mission you take on daily! Head on over to our tactical gear store and choose your options. If you want compact and vital essentials in a vacuum sealed version, this is as good as it gets. The IPOK.